Water. Air. Light. Heat. Exposure to certain metals. All enemies of diesel fuel quality and stability. Almost from the time it leaves the refinery, diesel fuel is attacked by exposure to the elements. These elements - water and air - causes oxidation and hydrolysis chain reactions to form in the diesel fuel, while exposure to light and storage in hot conditions simply provides more energy for the reactions to speed along. The chain reactions cause pure diesel molecules to react, split apart and form heavy gums and deposits. The result? Diesel fuel quality spirals downwards. Diesel fuel darkens. Heavy ends, gums and deposits form sludge at the bottom of tanks, and in the diesel engines that end up burning the fuel. At best, stratified diesel fuel doesn't burn as well in the diesel engine. At worst, not only is diesel fuel quality ruined, but the consumer has to pay to have the fuel removed, the tank cleaned and the fuel filtered and polished to restore its useability. Dee-Zol Life is formulated to stop harmful oxidation and hydrolysis reactions in their tracks. With as little as 1 ounce to 15 gallons of fuel, Dee-Zol Life prevents stored fuels from aging and forming sludge. Fuels protected with Dee-Zol Life are prevented from darkening. Filter plugging from shellac and gum or varnish deposits is reduced, and corrosion in tanks is eliminated by the metal deactivation ingredients in the Dee-Zol Life formula. Stored diesel fuels treated with Dee-Zol Life meet or exceed U.S. Military, NATO, and Engine Turbine Manufacturer standards for stored diesel fuel quality. Don't let the enemies of stored fuel quality take money out of your pocket. 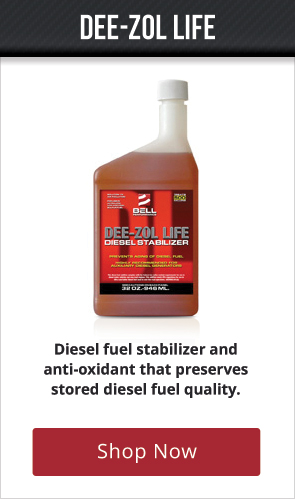 Protect your stored diesel fuel investment with Dee-Zol Life.